The next forum will be held in Downtown L.A. this Wednesday, March 19 from 5 p.m. to 8 p.m. at Metro HQ, just behind Union Station. Following that will be this Saturday, March 22nd from 9 a.m. to 12 noon at South L.A.’s Martin Luther King Recreation Center on Western at 39th. Planning forums continue through April 12th – full schedule after the jump. Mayor Garcetti’s staff are also promoting their Great Streets Initiative. Various local initiatives, including the Boyle Heights Community Plan Update, will be featured at the forum taking place in the corresponding location. 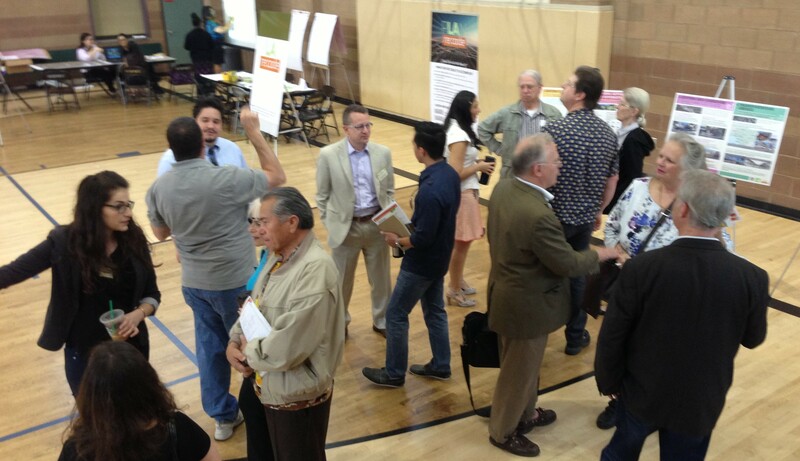 Saturday’s forum at the Granada Hills Recreation Center was attended by several hundred people. Attendees included members of San Fernando Valley Neighborhood Councils, hillside homeowner associations, and members of the city of Los Angeles’ appointed Bicycle Advisory Committee. With the open house format, it’s difficult to get much of an overall sense of how the draft plans were being received. Issues overheard discussed ranged from concern over toxic soils, to the taxpayer cost of large-scale planning efforts, to the loss of a “great cut-through [for cars]” on Wilbur Avenue. These three initiatives will exert a great deal of influence on the way Los Angeles changes and grows over the next twenty-plus years. If Streetsblog readers want to see a city that prioritizes walking, transit and cycling, it’s important to attend a forum, familiarize yourself with the plans, and let the city know your comments. The DCP, especially in their Mobility Plan 2035, is proposing fundamental changes to L.A. streets: re-allocating car space to transit on “TEN”streets (Transit Enhanced Network), constructing protected bikeways on “BEN” streets (Bicycle Enhanced Network), and prioritizing walking in “PED” neighborhoods (Pedestrian Enhanced Destination areas.) If you want to see these changes remain in these plans, and move from plan to on-the-ground change, then head down to one of these forums and speak your piece. When: Wednesday, March 19; 5 p.m. – 8 p.m. When: Wednesday, April 2; 6 p.m. – 9 p.m. 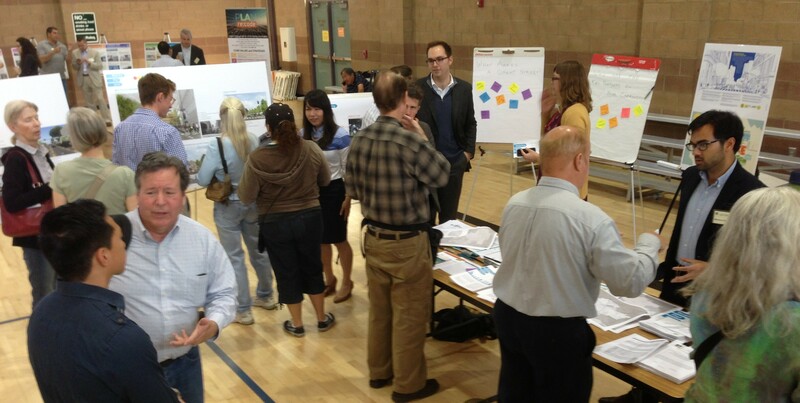 When: Saturday, April 12; 10 a.m. – 1 p.m.
North Valley constituents express their opinions about the proposed plans. Which forum will you attend? On page 19 of the draft EIR, many of the streets designated for the bikeway-backbone network have pink lines which indicate anticipated installation after 2035. Evidently, there will be much more space available for bike lanes at that time due to much less population and driving. Or, perhaps this lengthy delay was made to make sure that most of the current government employees will be retired by then. One of the arguments frequently made against installing bike lanes on an arterial street is that the bicycling mode share is very low and taking away a motor vehicle lane will impede the flow of traffic. Well, how much mode share does a parking lane have and isn’t storing vehicles on a busy arterial contributing towards traffic congestion by taking up roadway space? Another form of reasoning is that there has to be parking directly in front of the businesses on a arterial street. Big box stores have very little parking close to the front doors to the businesses. In fact, very few successful large shopping malls have a roadway running down the middle of where the stores are placed. Not having adequate parking within a short walking distance to a store would likely detour customers, but the success of the big box stores and large shopping malls clearly shows that parking directly in front of the stores is not a requirement for success.